The kitchen is usually the most the neglected area of the house. People often spend more time decorating their bedrooms, bathrooms, and living rooms, while ignoring important aspects of the kitchen like its floor tiles. If you happen to just notice your kitchen tiles design, it’s high time that you get them reinstalled by a professional tiler in Singapore. Kitchen floor tiles are deemed very important as they are installed in an area that are prone to accidents. When selecting kitchen tiles, make sure to consider ones with non-slip features. While you should consider how the floor tiles design will look like in your kitchen, also choose how they will impact your safety. A wooden tiles design seems to be getting very popular these days. 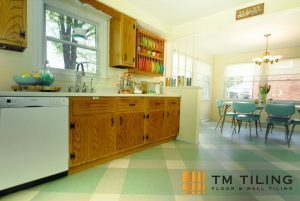 Most interior designers use vinyl tiles to achieve a wooden-like effect for the kitchen. Having these tiles installed can make an area classier, hence enhancing spaces like the kitchen. If you want to avoid the high maintenance that comes with having vinyl tiles installed, you can still opt for a wood design using ceramic tiles. To complement these wooden tiles, most designers also install grey wall tiles and cabinets. 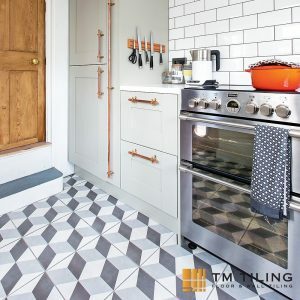 If you want a more unique design for your kitchen floors, then go for checkered tiles. This tile design is assembled by placing black and white tiles in checkerboard patterns. 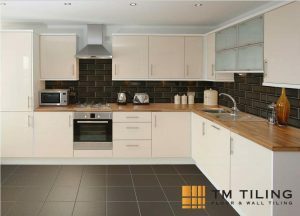 Use monochrome coloured tiles to give a classic look to your modern kitchen. If you prefer having a clean-looking kitchen, then use black coloured natural stone tiles or ceramic styles. With black coloured design, dirt on your tiles would not look as obvious as it is on white tiles. You can also use matte finish ceramic tiles or granite to add a bit of glamour to your kitchen. 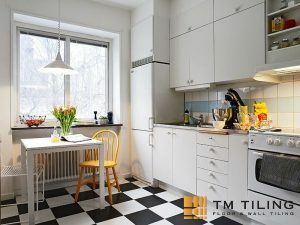 Complement these black coloured tiles with white or grey coloured furniture as this black and white combination gives a subtle and elegant look to your kitchen. Love more classic, old, and elegant designs? 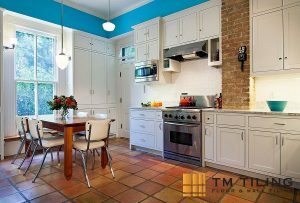 Then consider using terracotta tiles for your kitchen. The reddish hue will not only enhance your kitchen, but the intricate tile design will also make the kitchen area stand out from the rest of the house. 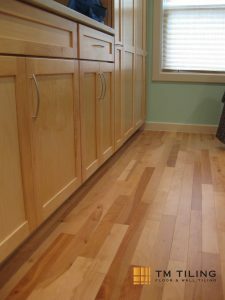 The rustic-looking floor will undeniably bring warmth and comfort to anyone who steps into the kitchen area. You can also choose to lay them in different tile patterns if you’re looking for different options. Ceramic tiles are considered one of the types of tiles most suitable for kitchens. You can choose from a variety of options – from colourful patterned tiles to more simple ones with vintage designs. These Mediterranean style ceramic tiles can be laid out by mixing different types of design altogether. 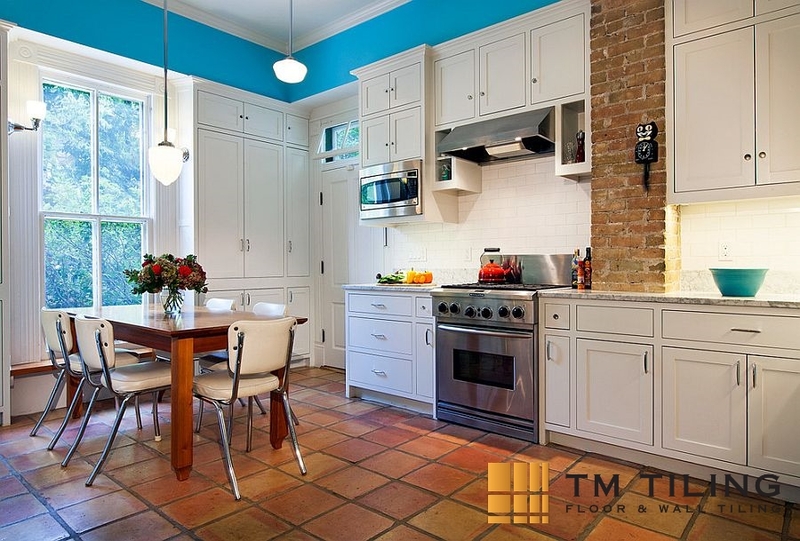 If you want your kitchen to look lively and bright, use bright colored natural stone tiles. The tiles cut out of natural stones have earthier tone and texture. The turquoise and orange hue granites are the latest tiles designs used these days to make it classy. Give your kitchen a worn out and rustic look with the bursts of colors revealing on the natural stones. Geometric patterns are not only for bathrooms wall tiles. They can be exclusively used on the kitchen floors as well. These geometric patterns come in natural stone tiles and ceramic tiles that are cut in different geometric patterns and colours. Have a kitchen tiling work in mind? 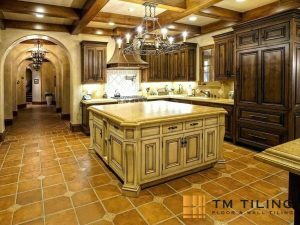 TM Tiling Singapore provides a variety of tiling services suitable for any areas and budget. Just contact us to speak to our professional tiling contractors regarding any tiling needs. While you’re at it, browse our range of completed tiling projects. Call us now at +65 6653 5655 or email us at enquiry@tmtiling.com. Our team of tiling experts will get back to you as soon as they can.